Originally posted by rsowden in the PS04 forum. We wondered what was next. Now we can even fly to the moon with Zoom!!! Sam Ash has them for $299. The H4 includes 2 combination XLR-1/4-inch input jacks with 48V or 24V phantom power and a high-impedance phone input for guitar, bass and synth recording. 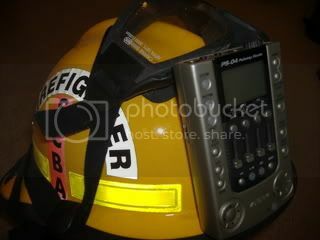 Four hours of continuous recording operation can be accomplished with 2 AA batteries. 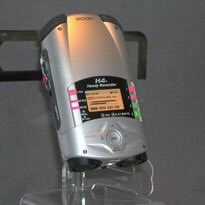 A back-lit 128 x 64 pixel LCD provides visual feedback of the recording. Maximizing flexibility was an important design goal, and the H4 renders audio in several different recording formats: 16-bit PCM, 44.1 kHz sampling; 24-bit PCM, 48/96 kHz sampling (stereo) and MP3, 48kbps - 320k bps (stereo). A 64MB Secure Digital (SD) card is included. With an optional 1GB SD memory card, the H4 provides 190 minutes of recording in 16-bit mode, and 34 hours in MP3 stereo mode. 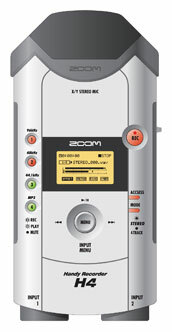 Of course, the Zoom H4 is loaded with recording effects (compressor, limiter and mic modeling for stereo mode), in addition, guitar effects equivalent to the Zoom G2 are also provided. The Zoom H4 comes bundled with Cubase LE and includes USB audio and mass-storage interfaces. A windshield cover and tripod attachment are also included. looks good, but I don't know that it has enough on it to make me shell out for it just yet. My question is, no virtual tracks? What can you do with just 4 tracks? Record two stereo vocals and call it a day I guess. How can Sam Ash have them when Zoom itself only has a gif image of it?! This space for rent - reasonable rates. Serious callers only. No Iconists. No Child-burning Religious fanatics. It indicates that there are "guitar effects" on this unit, but does it also have the Zoom drums and bass? The Samson tech page said it came with Cubase. I think that might be the answer for several of the questions here? Though it doesn't make much sense to have both an SD card and no possibility to mix/bounce on the unit. I mean: Is it for working stand-alone or is it for recording on a PC? Cute . . . but in no way does this compete with the PS or MRS products. Let's hope it doesn't have the Zoom drums. I still prefer the Norelco though. 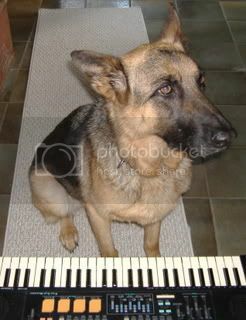 Riffmaster wrote: I still prefer the Norelco though. Rocketing towards 5000 posts without a care in the world! I dunno - it looks kind of fisher-price "my first home recorder" to me... what gap are they trying to fill in the market with it? However the guitar interface stuff is not consistent with that. I think the target is as an audio interface that can be unhooked and used elsewhere. I do think that's a VERY useful tool but not sure the price and features (no v-takes ???) match up yet. It serves many users – ENG is a big field which the unit is kind of geared towards, but for musicians this unit will be great. 3. USB connectivity – it will act as a Hard Drive AND it will act as a USB interface (meaning that you can use this unit to record guitars and vocals into your computer). I’m sure others will find uses for it, but ENG, Podcasting and home recording will be the primary markets. ENG is electronic news gathering. So, interviewing Tony regarding the HMHS for example. As an interface this could actually be pretty cool. I need to hear the effects, but from what I've heard from people on this forum the G2 effects are very good.